Was looking at that. Teen Dazzler and Teen Tigra as roommates? Wut? Someone else mentioned it and now I can't get over it. Terry Crews would have made a much better Genie and now that's the movie I want. Daaaaaaaaaaaaaaaammit, why did you have to put that glorious idea in my head?! ..,but NOT you, Eddie Murphy. No, you had your chance. I'd like to add Jeff Goldblum to the list. I feel like he could have brought his own feel to the Genie, something a bit more sardonic but still eccentric. I don't get why the whole internet seems to be so against Smith as genie, or why everyone seems so infatuated with the idea of Terry Crews as genie. It's not like I'm a huge Will Smith fan, but he's a capable actor who can do a good comedy performance and will certainly bring his own flair/style. Crews ... is just a variation on a theme? I could understand people wanting someone completely different, but Crews would just be more or less the same but slightly altered. My best take is that the Internet thinks Smith will either phone it in à la MiB2, or else that Smith has already done enough/been in enough that Crews should be allowed the chance to stretch out. Personally, I don’t think that either of them are really “right” for the role ... IF the idea was to find someone who could fill Williams’ itty-bitty living space, that is. I feel like Smith was chosen by whoever did the casting mainly because they were looking for someone who could really fill Genie’s big musical numbers. I think it's because he's mostly steered away from Comedy since 2012? They are supposedly steering pretty far away from the Williams performance to be more in line with the current style from the on-going Aladdin Broadway musical (which is pretty great actually, I saw it in October). It's a bit less random (but still a bit wacky and definitely funny) and more heartfelt. Ah I’d forgotten about the show. I always forget that Disney puts out a musical/theatre/“on ice” version of everything, too. I personally am not a huge fan of Smith's genie because, from the brief glimpse we got in the trailer, I didn't see Will Smith playing the genie, I saw Will Smith playing Will Smith. Having said that, I'm not going to go crazy over it, and I probably still will watch this movie. Mainly because of Naomi Scott. They get stranded in the Yukon? I don't think there's maple trees up there. Or maybe Newfoundland? (That'd be thematic at least) Mountains in that wide shot are a bit big for that though. I just like Terry Crews better for comedy, especially in the last 15 years , plus I think he does larger than life better. My basing my reaction on a short clip is because that's all they've shown but I'm speaking more visually at this point. It looks like an uncanny Marianas Trench that I poorly copy pasted Smith's face, too small, on to. Crews wouldn't need so much cgi to look the part. I think it's less about Will Smith (who I honestly l think is very talented) and more having to do with the awkward CGI as @Far mentioned. But now that you guys have mentioned it, I wouldn't mind to see Terry Crews take on the Genie. I think his work on Brooklyn 9-9 and Craig of the Creek has shown he has the chops to make a more heartfelt Genie, like James Monroe Iglehart did on Broadway. 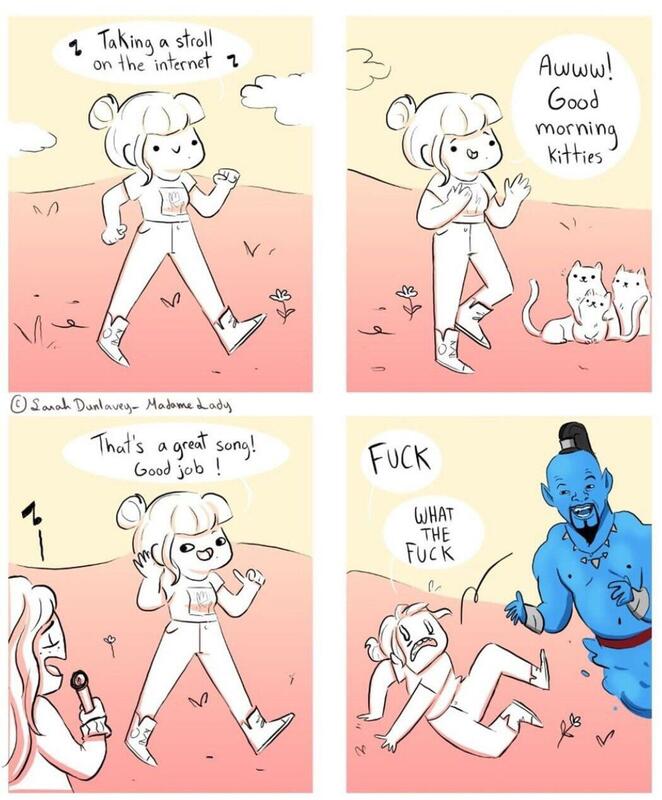 I think the best thing you can do as the Genie right now is make it your own, DON'T try to be Robin Williams. No one can be Robin Williams, and anything close is going to pale in comparison. But if the Genie is as CG heavy as it seems to be, part of me wonders if they would have let Robin do the role again if he were still with us. Or if he would have broken the animators. Honestly, I think if they sometimes made the genie a little transparent, like when he has a smoky bottom-half, it would look pretty good. Not quite like a force-ghost but in that direction. The CGI looks like garbage. I would guess that's 90% of why people are complaining. part of me wonders if they would have let Robin do the role again if he were still with us. Or if he would have broken the animators. I feel pretty confident that he would've refused the part. Too much bitterness about the shenanigans on Disney's part. He made up with Disney over the unauthorized use of his likeness to sell merch, early enough that he was part of the third Aladdin and a few other movies with them afterwards. Getting gifted a Picaso eases many wounds. I know he was part of A3, but I imagine he was still a bit sour about the whole thing, Picasso or no Picasso. He also did Jack and Bicentennial man with Disney subsidiaries. He clearly let it go. And upon looking now, many others directly with Disney themeslves. Not sour enough to stop working with them. He did a number of projects with Disney, both Genie and not-Genie related after the issue, so I'm going to assume he was sated by the apology. EDIT: Slightly ninja'd by Far. Add Flubber, too. Star Wars Galaxy's Edge (Star Wars themed lands at Disneyland and Disney's Hollywood Studios in Florida) had their opening dates confirmed today. Disneyland version will be opening on May 31 and the WDW version will be August 29. DL will be a confirmed two stage opening, food, merch and Millenium Falcon ride will open first, the Rise of the Resistance ride will be at a later date. Not sure if the WDW version is following the same type schedule. If Disney is willing to stop this "Disney Vault" nonsense and put EVERYTHING... and I mean -EVERYTHING- that they've released on their service, I'd consider it. While the debut date is still unknown, we now know that the service will include the entire Disney movie library shortly after the service launches. [...] Disney CEO Bob Iger [...] point[ed] at the retirement of Disney's longstanding "vault." [...] "The service... is going to combine what we call library product, movies, and television, with a lot of original product as well, movies and television," Iger said. "And at some point fairly soon after launch, it will house the entire Disney motion picture library, so the movies that you speak of that traditionally have been kept in a 'vault' and brought out basically every few years will be on the service. And then, of course, we’re producing a number of original movies and original television shows as well that will be Disney-branded." In 2017, Disney announced that it would remove its content from Netflix to prepare for the launch of Disney+ in 2019. The picture became clearer as Disney clarified that its movies and properties that it acquired, like Star Wars and Marvel films, would also disappear from Netflix. That content and other licensed properties will likely also stream exclusively on Disney+. Also there is no word on whether any (older) content will be sanitized in an attempt to protect Disney’s image. I doubt that we will be seeing Song of the South anytime soon. Yeah, I know. Or an uncensored Peter Pan, Lady and the Tramp, or Dumbo. And that’s a shame. I'll never get over cosmic horror Dumbo (prompted by human eyes on baby elephant = creepy). Probably because to me he has a high-pitched cartoon old man voice. The pink elephants song was scary for me as a kid. The eyes never bugged me.